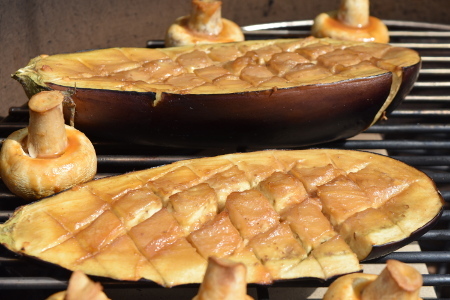 Smoked miso aubergine (eggplant) is an absolutely delicious barbecue treat. I remember my dad first cooked this when we had some guests over, served with some grilled corn on the cob and freshly baked bread; it went down a storm with us and our meat-eating guests alike! This is one of the first dishes that really made me appreciate that a barbecue does not need meat. The cooking on the smoked miso aubergine is quite interesting; we use a combination of direct grilling and indirect smoking. 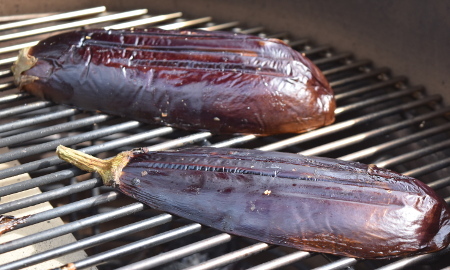 The indirect smoking allows the miso marinade in the aubergine to really develop and take on the flavour of the sweet cherry smoke, whereas the direct grilling at the end allows for the caramelisation of the surface of the aubergine. For this, (if using a ceramic barbecue) you’ll need a heat deflector stone for the first 30 minutes of indirect cooking; we use a Monolith barbecue where the heat deflector stone comes in two halves, so we can just lay down half on one side of the barbecue and smoke the aubergine over it, before turning the aubergine over to the side of the barbecue without the heat deflector stone for 60 seconds of direct grilling at the end. Serves 4. Prep time: 10 minutes. Marinade time: 30 minutes. Cooking time: 30 minutes. Allergens: soy (miso paste, soy sauce), gluten (soy – use tamari to make it gluten free), sesame (sesame oil, sesame seeds). Start by cutting the aubergines in half lengthways, and score the flesh diagonally creating a criss-cross pattern on the surface. Try not to cut the aubergine skin in the process! Mix together the miso paste, soy sauce, maple syrup, sesame oil, garlic and ginger in a small bowl. 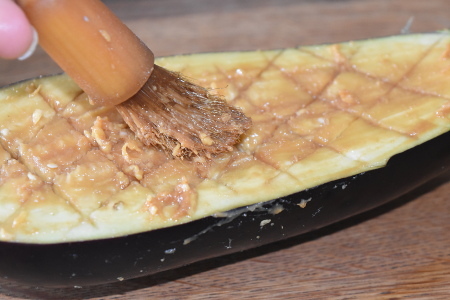 Once the paste is fully mixed, use a pastry or basting brush to apply the marinade to the scored surface of the aubergine. Feel free to squeeze and stretch out the aubergine to get the marinade deep into the cuts in the aubergine flesh. Leave to marinade for 30 minutes. While waiting for the aubergine to soak up all of the lovely miso flavour, light the barbecue. 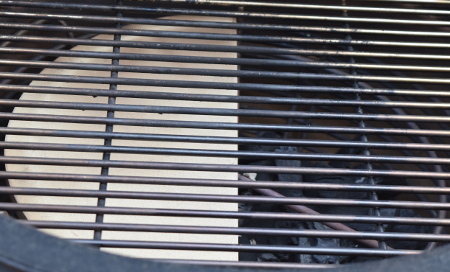 First of all you want to cook on indirect heat, so put in a heat deflector stone (just on half of the barbecue if possible – we want to cook on direct heat a bit later!) before adding the main grill. Heat the barbecue up to about 160°C (320°F). When you’re ready to cook, pop the aubergine halves, skin down, on your barbecue grill above the heat deflector stone. At this point, add some cherry smoke wood chips onto the charcoal. Leave to smoke roast for 30 minutes. Once the smoked miso aubergine halves are cooked, turn them flesh-side down and grill it for 60 seconds on direct heat – without the heat deflector stone. This will allow for the aubergine flesh to caramelise nicely. 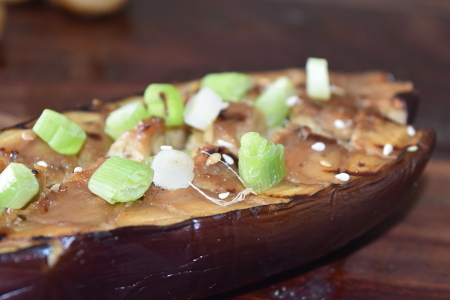 Take your smoked miso aubergine halves off the barbecue and they are now ready to eat! Serve with some freshly baked bread – my barbecued flatbreads work well. Enjoy! Miso is a Japanese food derived from soya and fermented using their special koji fermentation culture. Used in a variety of Japanese dishes, miso is also known to have a variety of health benefits! I’m no expert on Japanese cooking, so for more information on miso see here.